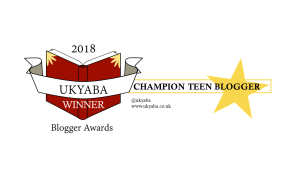 I’m Amy; a Scottish award-winning (bizarre, I know) teen blogger of mainly MG and YA books, with a sprinkling of TV/film, Disney and music posts along with whatever else takes my fancy, usually every few weeks or so. I am also the owner of two golden retrievers, who inspired my blog name. My favourite books include the Geek Girl series, the Murder Most Unladylike series, Boy in the Tower and Simon Vs the Homo Sapiens Agenda, to name just a few, and I found choosing those actually quite painful for my soul, which may give you an idea of how indecisive I am in general. I’m an insufferable fangirl for Dynasty, Suits, the Mentalist, Grey’s Anatomy, Pretty in Pink, Love, Simon, George Ezra, Into the Ark and Panic! at the Disco to name just a few, and if you stick around you can expect to see those names pop up quite a bit. I especially love combining those with eating chocolate or mint choc chip ice cream (my ultimate favourite foods) and doggy cuddles. My star sign is Scorpio (though I have no idea if I fit the profile), I’m a Ravenclaw that has confused many an online Sorting Hat, and most crucially to all of this stuff, I am Team Duckie forever and ever and ever. Andie was a fool, much as I obviously love her.